Ninja Octopuses are everywhere these days. Right now, I caught one under my mind control just before he stepped on a bunny. Now, I'm at a crossroads. I'm really not sure what to do. Should I let nature takes its course, should Ninja Octopus step on the bunny? Or should I let the bunny escape and Ninja Octopus starve. Please leave your vote in a comment! Ninja Octopus and Bunny needs your help! 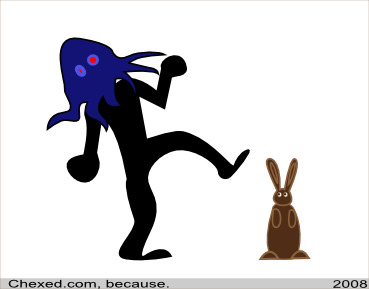 The Ninja Octopus smashes the bunny. But it turns out the bunny is really just a chocolate Easter rabbit. The Ninja Octopus gets dirty chocolate stuck all over the bottom of his foot. And he hates chocolate. Hosted by HostNine This page was created in 0.00646209716797 seconds.